The news which the gospel hath in its mouth to tell us poor sinners is good. It speaks promises, and they are significations of some good intended by God for poor sinners. The law, that brings ill news to town. Threatenings are the ‘lingua vernacula legis’ – the native language of the law. It can speak no other language to sinners but denunciations of evil to come upon them, but the gospel smiles on poor sinners, and plains [smooths] the wrinkles that sit on the law’s brow, by proclaiming promises. 1 Timothy 1:15. This bridge which the gospel lays over the gulf of God’s wrath, for poor sinners to pass from their sins into the favor of God here, and into the kingdom of God hereafter, is supported with no other arches than the wisdom, power, mercy, and faithfulness of God…. 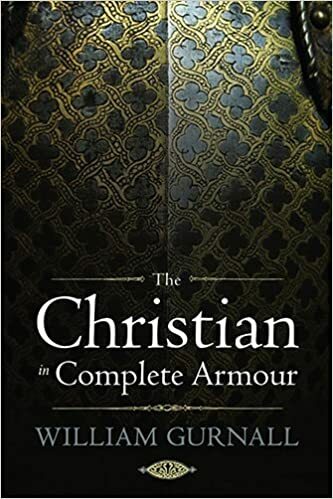 William Gurnall, The Christian in Complete Armor, Direction seventh, 1.1, 1.5. Forasmuch as this epistle is the principal and most excellent part of the New Testament and most pure evangelion, that is to say, glad tidings, and that we call gospel, and also is a light and a way unto the whole Scripture; I think it meet that every Christian man not only know it, by rote and without the book, but also exercise himself therein evermore continually, as with the daily bread of the soul. No man verily can read it too oft, or study it too well; for the more it is studied, the easier it is; the more it is chewed, the pleasanter it is; and the more groundly it is searched, the preciouser things are found in it, so great treasure of spiritual things lieth hid therein. I will therefore bestow my labour and diligence, through this little preface or prologue, to prepare a way in thereunto, so far forth as God shall give me grace, that it may be the better understood of every man: for it hath been hitherto evil darkened with glosses and wonderful dreams of sophisters, that no man could spy out the intent and meaning of it; which nevertheless of itself is a bright light, and sufficient to give light unto all the Scripture. William Tyndale, Doctrinal Treatises and Introductions to Different Portions of the Holy Scriptures, ed. Henry Walter, vol. 1, The Works of William Tyndale (Cambridge: Cambridge University Press, 1848), 484. The difference, then, between the Law and the Gospel is this: The Law makes demands of things that we are to do; it insists on works that we are to perform in the service of God and our fellow-men. In the Gospel, however, we are summoned to a distribution of rich alms which we are to receive and take: the loving-kindness of God and eternal salvation. Here is an easy way of illustrating the difference between the two: In offering us help and salvation as a gift and donation of God, the Gospel bids us hold the sack open and have something given [to] us. The Law, however, gives nothing, but only takes and demands things from us. Now, these two, giving and taking, are surely far apart. For when something is given [to] me, I am not doing anything towards that: I only receive and take; I have something given [to me]. Again, when in my profession I carry out commands, likewise when I advice and assist my fellow-man, I receive nothing, but give to another whom I am serving. Thus the Law and the Gospel are distinguished as to their formal statements (in causa formali): the one promises, the other commands. The Gospel gives and bids us take; the Law demands and says, This you are to do. Understanding this distinction helps us remember that justification is by grace alone through faith alone in Christ alone. Understanding this distinction helps us remember that receiving Christ’s work by faith is how we can stand before God and be accepted by him. Justification does not come by doing (law) but by receiving something that has been done for us (gospel). More can be said for sure – but suffice it to say in brief that a proper distinction between the law and the gospel helps us keep our eyes off ourselves and on our Savior. The above quote is from C. F.W. 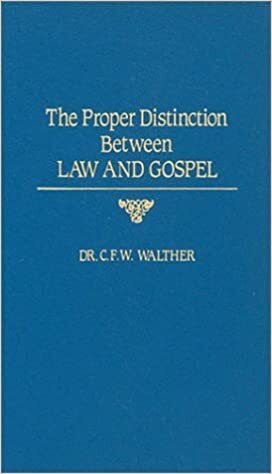 Walther, The Proper Distinction between Law and Gospel (St Louis: Concordia Publishing House, 1986), 19. We divide this Word into two principal parts or kinds: the one is called the “Law”, the other the “Gospel”. For all the rest can be gathered under the one or the other of these two headings. What we call Law (when it is distinguished from Gospel and is taken for one of the two parts of the Word) is a doctrine whose seed is written by nature in our hearts. However, so that we may have a more exact knowledge, it was written by God on two Tables and is briefly comprehended in ten commandments. In these He sets out for us the obedience and perfect righteousness which we owe to His majesty and our neighbours. This on contrasting terms: either perpetual life, if we perfectly keep the Law without omitting a single point, or eternal death, if we do not completely fulfil the contents of each commandment (Deut. 30:15-20; James 2:10). What we call the Gospel (“Good News”) is a doctrine which is not at all in us by nature, but which is revealed from Heaven (Matt 16:17; John 1:13), and totally surpasses natural knowledge. By it God testifies to us that it is His purpose to save us freely by His only Son (Rom. 3:20-22), provided that, by faith, we embrace Him as our only wisdom, righteousness, sanctification and redemption (1 Cor 1:30). By it, I say, the Lord testifies to us all these things, and even does it in such a manner that at the same time he renews our persons in a powerful way so that we may embrace the benefits which are offered to us (1 Cor 2:4). We must pay great attention to these things. For, with good reason, we can say that ignorance of this distinction between Law and Gospel is one of the principle sources of the abuses which corrupted and still corrupt Christianity. Theodore Beza, The Christian Faith, trans. James Clark (Lewes, UK: Christian Focus, 1992). One, however, might say: Yes, I would also gladly believe if an angel thus from heaven were to preach to me. This is very foreign to the subject. Whoever does not receive the Word for its own sake, will never receive it for the sake of the preacher, even if all the angels preached it to him. And he who receives it because of the preacher does not believe in the Word, neither in God through the Word, but he believes the preacher and in the preacher. Hence the faith of such persons does not last long. But whoever believes the Word, does not care who the person is that speaks the Word, and neither will he honor the Word for the sake of the person; but on the contrary, he honors the person because of the Word, and always subordinates the person to the Word. And if the preacher perishes, or even falls from his faith and preaches differently, he will forsake the person of the preacher rather than the Word of God. He abides by what he has heard, although the person of the preacher may be what he will, and come and go as he may. The true difference between godly faith and human faith consists also in this, that human faith cleaves to the person of the preacher, believes, trusts and honors the Word for the sake of him who spake it. But godly faith, on the other hand, cleaves to the Word, which is God himself; he believes, trusts and honors the Word, not because of him who preaches it; but because he feels it so surely the truth that no one can ever turn him again from it, even if the same preacher were to try to do it. This faith triumphs in life and death, in hell and heaven, and nothing is able to overthrow it; because it rests upon nothing but the Word without any regard whatever to persons. Martin Luther, “Second Christmas Day (Luke 2:15–20),” in Luther’s Church Postil: Gospels: Advent, Christmas and Epiphany Sermons, ed. and trans. John Nicholas Lenker, vol. I, The Precious and Sacred Writings of Martin Luther (Minneapolis, MN: Lutherans in All Lands Co., 1905), 162–163. And what did we under the papacy but walk blindly? We suffered ourselves to be led just as we were directed by the names of God and the saints. I was myself a pious monk and priest, holding mass daily, wherein I worshiped St. Barbara, St. Anna, St. Christopher and others—more saints than the calendar mentions, some of whom no one knew anything about. I had no knowledge of Christ, I knew not why I should find comfort in him nor what I should expect of him. I was as much afraid of him as of the devil himself, regarding him more a stern Judge than a Saviour. How many shameful pilgrimages were made to dead idols of wood and stone, images of Mary and of the saints! How many were the pilgrimages to the graves of the dead, and to bones called “holy relics”! These relics were mere open deception, devised by shameless impostors; yet such worship was established by popes and bishops, and indulgences granted therefore. How many new saints, new brotherhoods, new psalms to Mary, and new rosaries and crowns did the monks daily invent! In fact, everything each individual monk might dream of had to be a special form of worship, and no one inquired whether or not it was at all authorized by God’s Word. When we had done all, we were uncertain that we had pleased God. What was this sort of worship but a worship of dumb idols in the place of the living God—idols which could not talk with us and could not give any definite information or comfort, but left the people fettered and ruined with eternal doubts? But Christians, as Paul says, have not a dead and dumb god, for which the Lord be praised! Nor will we countenance such idols. We have a living, speaking God, who gives us his infallible Word. We know how he is disposed toward us and what we may expect from him; namely: through faith in Christ we have forgiveness of sins and are his beloved children; and as evidence of acceptance with God, we have baptism and the Holy Supper, the office and gifts of the Holy Spirit, by which he works in our hearts. We know that in the faith of Christ our works and lives are pleasing to God, and that he will hear and help when in our distress and weakness we cry unto him. Martin Luther, “Tenth Sunday after Trinity (First Corinthians 12:1–11),” in Luther’s Epistle Sermons: Trinity Sunday to Advent, trans. John Nicholas Lenker, vol. III, The Precious and Sacred Writings of Martin Luther (Minneapolis, MN: The Luther Press, 1909), 202–203. Here’s a newer and very good resource on fighting sin and growing in grace: Diehard Sins by Rush Witt. I have to admit when I first got this book I wasn’t sure what to expect since I’ve read similar books on the topic – some good, some not so good. This is one of the good ones! There are three main parts: 1) Enter with Joy into Your Struggle against Daily Sin, 2) Understand the True Needs of Your Heart, and 3) Bring Christ and his Provisions to Your Fight. The topics covered include a discussion of the nature of sin, what it means to struggle with sin, how to detect sin in your own life, and applying the gospel to the struggle with sin (among others). I appreciate the book first because it is rooted in Scripture and very much grounded in the gospel. Witt strikes a nice balance between resting in Christ and actively putting sin to death – you can only do the latter by doing the former. A big picture summary of the book would probably be like this: How to fight sin by depending on Christ. Since there is a proper law/gospel distinction, the book gives some helpful biblical lessons in fighting sin. Another strength of the book is that Witt approaches the topic from a counseling perspective. It’s not a counseling book specifically, but there are some counseling themes and, in my opinion, helpful wisdom on practical ways to put sin to death. For example, one appendix is a brief outline to resisting temptation: Refuse, Replace, Pray, and Praise. Finally, I appreciate how the author mentions that we fight sin best in the context of the body of Christ and the means of grace: the last chapter is called “Fighting Sin in the Community of Faith.” This book isn’t a call to fight sin on our own, but to do it depending on grace while walking beside and with other believers. 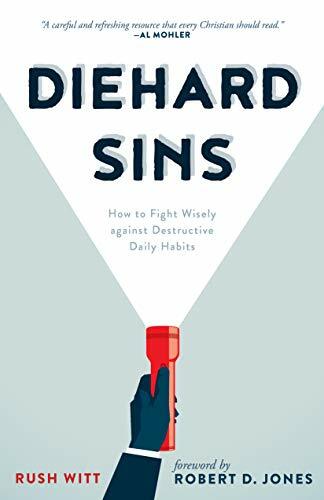 If you want a good resource on fighting sin, I very much recommend this one: Diehard Sins. There are a few reflection questions after each chapter, so it would make a good group study or book club resource. I’m glad I own this book, and I’ve already used it in my own ministry! Rush Witt, Diehard Sins, (P&R Publishing, 2018).